A number of new and familiar faces will be leading the Rams this year, as wrestling, baseball, and basketball welcome new assistants and head coaches. Shawn Voigt ’90, a four-time all-American and 1990 NCAA Division III national champion at Cornell College, returned to Cornell as a full-time assistant coach on Mike Duroe’s wrestling staff. Voigt has 16 years of coaching experience at the high school and collegiate levels, including a previous stint as a Rams assistant from 1997–99. The Mount Vernon native spent the past 10 years at West Branch High School, where he taught social studies and was head wrestling coach from 1999–2007. Left: Chad Murray, new head men’s basketball coach. Right: Shawn Voigt ’90, former national wrestling champion and new assistant wrestling coach. Also returning to the Hilltop is Adam Hadenfeldt ’06 as the head baseball coach. Hadenfeldt coached and taught for three years at HLV Community School in Victor, Iowa, holding head coaching positions in baseball and girls track. At Cornell, Hadenfeldt was a letter winner in both football and baseball. He inherits a team that finished 10–23 overall and 7–14 in IIAC play. A new face this year is Chad Murray, who takes over for Mike DeGeorge as head men’s basketball coach after DeGeorge resigned over the summer. Murray has some rather large shoes to fill, as he takes over a team that set records for victories and qualified for the NCAA Division III Tournament last season. Murray was the top assistant and recruiting coordinator the past five years at North Central (Ill.) College and spent eight years as an assistant coach at the Division III level with stints at Nebraska Wesleyan University (2001–02), Vassar (N.Y.) College (2002–04), and North Central (2004–09). 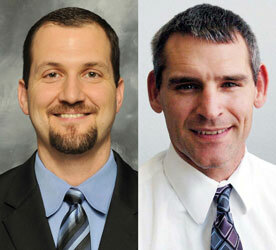 Two other Cornellians returned to the Ram’s football team as coordinators this year. Don Dicus ’85 and Adam Eichhorn ’06 took over as the offensive and defensive coordinators, respectively, this year. Dicus was the head coach at Cardinal Newman High School in West Palm Beach, Fla., before moving back to the Midwest. Eichhorn was previously the defensive line coach at Marietta (Ohio) College.